The most important applications of nanoparticle types and the common practices for control of plant diseases are described. The chapter will not include a description of all diseases that occur globally or a comprehensive report on the selected diseases and nanoparticles. 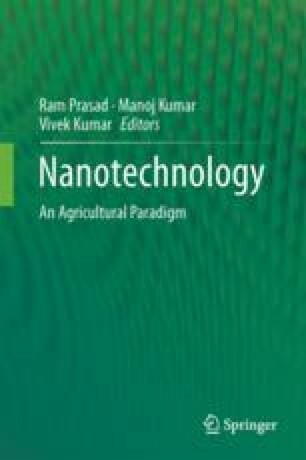 We have tried to contain information on the impact of the disease and the role of nanotechnology to face these challenges as modern technology in plant control and also report a short, historical background for some nanoparticle types. We have attempted to include the newest literature and scientific research related to each nanoparticle type. We will focus on the synthesis of NPs of some compounds and their influence on plant diseases. The chapter consisted of four sections. The first section will elucidate the meaning of nanotechnology and scientific progression. Section 15.2 covers major information about plant diseases as challenges in agriculture development. The third section will include important techniques that are used to detect and manipulate causal agents of plant diseases and the use of nanoparticle in disease control. The last part addresses a common nanoparticle that is used as control agent for some plant pathogens. The corresponding author gratefully acknowledge the support from Federation of Indian Chambers of Commerce & Industry (FICCI) and CV Raman International Fellowship for African Researchers Program.